1) For 50 minutes on Tuesday night, the Vancouver Canucks didn't have much going. Sure, they opened the scoring 88 seconds into the hockey game, but from there they looked like they might fade quietly into the night in their final game of the season in front of the home fans at Rogers Arena. But after withstanding an early third period push from the Sharks, the Canucks came to life scoring two goals just over two minutes apart midway through the final period to turn a 2-1 deficit into a 3-2 lead. And they then sealed the victory into an empty net handing San Jose its 10th loss in the last 11 games. The Canucks, on the other hand, have matched a season-high with their third straight win and are 7-3-1 in their last 11 outings. The victory was the Canucks 20th of the season on home ice giving the team a 20-16-5 record at Rogers Arena this season. The 20 home wins are the most for the team since winning 24 in 2014-15. 2) Tanner Pearson scored the first two Canuck goals giving him five in his last seven games and seven in the 17 games he's played since being acquired from Pittsburgh at the trade deadline. He's not the flashiest player, but he knows where the net is and has shown an ability to get there. His first goal was the result of terrific hustle from Bo Horvat to beat Brent Burns to a loose puck on the end boards and he then deftly placed a between the legs pass on to the stick of Pearson who shovelled the puck past Martin Jones. His second goal came off a goal-mouth scramble in which Pearson spotted the loose puck and managed to tuck it in before Jones could cover it. The play was initially called no-goal by the on-ice officials, but was correctly overturned and then withstood a coach's challenge for goaltender interference. Pearson had seven shots on 10 attempts on the night and has certainly forged some chemistry with Horvat who now has 3+8=11 in the 10 games they have played together. 3) Thatcher Demko has won back to back games for the first time this season. And he's been very solid in both. After a season-high 37 saves against Los Angeles last Thursday, Demko came right back and made 33 saves against the Sharks -- holding one of the league's highest-scoring teams off the scoresheet over the final 49 minutes of the hockey game. Demko was at his best five minutes into the third period when the Sharks had a four-shot sequence in just over a minute that would have extended their lead to 3-1. The San Diego native looked confident as he stared down the San Jose shooters posting a second straight win against a California opponent. That third period stretch was the turning point in the hockey game because a goal there likely would have dashed any Canuck hopes of a comeback. Instead, Pearson scored at 11:18 of the third period and Markus Granlund scored at 13:39 to give the Canucks a lead they wouldn't relinquish. The Sharks had a late power play with Bo Horvat off for slashing, but Troy Stecher found the back of the empty San Jose net from 200 feet away to round out the scoring. Demko is now 3-1 in his last four starts and 4-3 on the season. 4) Demko and Jacob Markstrom were both winners on Tuesday. While Demko posted the victory in goal, Markstrom was named Canucks Most Valuable Player. 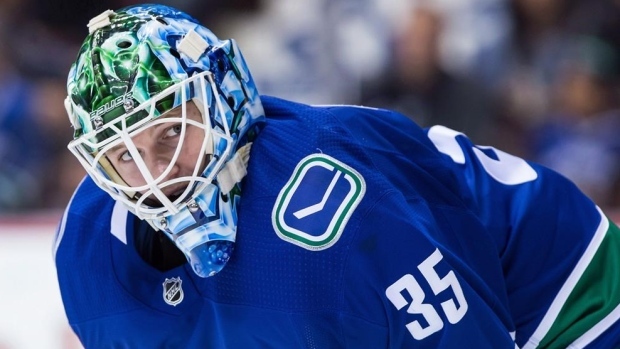 Elias Pettersson and Bo Horvat both deserved consideration for their seasons, but Markstrom was the correct choice in the fan vote. He has been the backbone of a hockey club that still struggles to score on most nights and has given the Canucks a chance almost every time out. His next start will be his 60th of the season so he has been both busy and good. His workload was heroic in November while Demko and Anders Nilsson were both out with injuries. He has played both ends of back to backs on five occasions this season. He has faced 40 or more shots in five of his last 18 starts -- and the Canucks are 3-1-1 in those games. With 28 wins, he'll be hard pressed to reach the 30-win mark since he may only play in one of the Canucks two remaining games. Regardless, it's been a terrific season for the 29-year-old netminder and it was good to see his efforts recognized. 5) Perhaps its a small thing, but the Canucks likely cleared a psychological hurdle (and Hertl) on Tuesday. The team had lost all three previous meetings against San Jose this season, had dropped six in a row going back to last Christmas and had just one win the last 13 times the Sharks were on the schedule. As Travis Green tries to build a team he can win with, a victory like Tuesday's -- even in the final week of the season with nothing on the line -- can serve as some sort of baseline for the Canucks to use next season when they see an opponent like San Jose. The Canucks had posted wins over top teams like Tampa Bay, Boston, Calgary and Toronto already this season, but it certainly felt like the Sharks had their number. And at 2-1 midway through the third, it seemed like perhaps the season sweep was in the offing. So give the Canucks credit for not going quietly. The win may not mean anything in the big picture this season, but it may be something the hockey club can draw on next year. The Canucks haven't had many regulation wins against playoff bound opponents, but they got one Tuesday. Now they'll try to back it up with another in Nashville on Thursday.